In the ’80s and ’90s, fat was the enemy, and we were eating Snackwell’s cookies by the box. Now the pendulum has swung and sugar is the devil, while we’re eating coconut oil by the spoonful. Have we lost our minds, or are we on to the next big thing? Sugar has been blamed as the cause of everything from obesity to cancer and many things in between. The fact is there’s nothing inherently wrong with sugar; our brains and nervous systems rely almost entirely on sugar for energy. But let’s hold up for a second: Not all sugar is created equal, and the term “too much of a good thing” definitely applies in this case. When I say there’s nothing inherently wrong with sugar, I’m not giving you a pass to eat Mars bars for dinner! This is a confusing topic, so lets start with the basics. Sugar is a molecule comprised of carbon, hydrogen and oxygen. Like all compounds made from CHO, sugar is a carbohydrate. Carbohydrates are macromolecules that can be simple (such as table sugar) or complex (such as starch). All carbohydrates, whether from a peach or a Pop-Tart, are broken down into sugar in the gut to supply the body with energy. In chemistry terms, most sugars end with the letters “-ose,” such as sucrose, fructose or lactose. The problem with sugar is that these days it’s added to everything from fruit juice to pasta sauce. 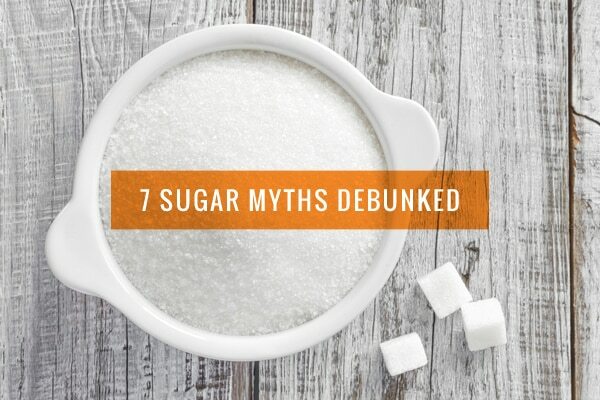 To try and help better understand this very complicated subject, I’ve debunked some popular sugar myths below. This is a popular myth, and how timely with Halloween just around the corner. Sugar has been studied extensively in relation to hyperactivity, and this myth has been solidly disproven. The thing is, people often consume sugar at celebrations or events where they’re stimulated by a lot of other things going on, so they’re actually just excited, not high on sugar. This belief is a hard one to shake, but it could all come down to a mind game. In one study parents who were told their children had consumed sugar were more likely to classify the child’s behavior as hyper or problematic (it turned out none of the children in this study had been given sugar). This probably one of the biggest nutrition myths there is. Here’s what’s what: If you have diabetes, either Type 1 or 2, you definitely need to watch your sugar and carbohydrate intake in order to manage blood sugar levels. However, if you don’t have diabetes, sugar intake alone won’t cause you to develop it. The main risk factors for Type 2 diabetes are being overweight or obese, an inactive lifestyle, and a diet high in overall calories from any source. The idea that brown and white sugar have big differences is another common nutrition myth. Brown sugar is actually just white sugar with molasses added back into it. It does contain very tiny amounts of some minerals due to the molasses content, but unless you eat a massive amount of brown sugar every day (please don’t), the nutritional difference between brown sugar and white sugar is a moot point. Coconut sugar, date sugar, agave nectar and other natural sugars are touted as healthier and more nutritious alternatives to refined sugar. Real talk: Sugar is still sugar. Regardless of the fact that it is less refined, it still contains around the same calories as white sugar and is metabolized in the same way. These natural sugars do contain some minerals, but you’d have to eat a LOT of the sugar in order to reap any nutritional benefits… which kind of defeats the purpose of using a natural sugar, no? The bottom line is that desserts made with natural sugars are still desserts and should be consumed in moderation. This really depends. Are we talking sugar-free because this item has actually been made without sugar? Then yes. But if we’re talking sugar-free because an artificial sweetener as been used instead of sugar, then hold up. There seems to be a new study published on artificial sweeteners published practically ever other week linking everything from disrupted gut bacteria to weight gain and diabetes to consumption of these sweeteners. This is a big area of nutrition research and one I know well. As many of the physiological reactions to sweeteners begin with taste receptors in the mouth, even ‘natural’ no or low-calorie sweeteners like stevia and xylitol are outside of my comfort zone. The reality is there is no magic bullet, and if it seems too good to be true, it probably is. You have to decide what’s best for you, but my advice would be consume the real thing less often rather than reaching for an artificial or low-calorie sweetener. Sugar has a plethora of disguises used on food labels, such as dextrose, fructose, fruit juice concentrates, glucose, invert sugar, maltose, corn sweetener, corn syrup, high-fructose corn syrup, lactose, raw sugar, sucrose, sugar syrup, cane crystals, cane sugar, crystalline fructose, evaporated cane juice, corn syrup solids, and malt syrup. That’s a lot of words for essentially the same thing! Learn your sugar synonyms and don’t let the labels fool you. Fruit contains carbohydrates, mainly in the form of the naturally occurring sugar, fructose. Vegetables also contain carbohydrates, but typically much less than fruits, and therefore they contain fewer calories. The idea that fruit is loaded with sugar needs to be put into perspective. Yes, there is sugar in fruit, but it’s not like it’s a sack of empty calories. That naturally occurring fructose is coupled with fiber, vitamins, antioxidants and anti-inflammatory compounds that help guard against disease. The soluble fiber in fruit helps lower cholesterol; the insoluble fiber helps moderate the absorption of sugar into the blood stream, stabilize blood sugar and keep you satiated. Rather than demonize an ingredient, we need to focus on the food as a whole. Learn to read nutrition labels and stay away from unnecessary added sugars, and keep consumption of the refined stuff to a minimum. Try to limit your sugar consumption to sugar you actually know about—like a batch of homemade cookies or a slice of birthday cake—and eat it mindfully. And enjoy it! Life deserves to be a little bit sweet from time to time. It’s true, many vegans and vegetarians avoid refined sugar and flour for that reasons. There are brands that don’t use bone char, but choosing unrefined sugar means avoiding this situation as well. Katie Trant, Hello, I haven given up Splenda and all fake sweeteners. I however, miss sweetness in my 2 cups of coffee per day. I am trying to lose about ten pounds and don’t want to screw up. Can I use 4 teaspoons of brown sugar in the raw/day, without raising my blood sugar and stopping my weight loss? What type of sweetener is ok to use? Good for you for giving up artificial sweeteners! Any calorific sweetener will cause your blood sugar to rise, but 2 tsp at a time shouldn’t cause a huge blood sugar spike if you generally don’t have problems with blood sugar regulation (if you do, you should speak to your doctor). I’d stick to the natural sweetners like you’re already doing, and perhaps try reducing them bit by bit. Can you go down to 1 tsp per cup? If you do that slowly you might not notice it! Thanks Sam! Sugar is a huge and very confusing topic, but hopefully we’ll be able to better understand it as time goes by. The way I look at food is…if God didn’t make it, don’t consume it. He made certain foods and drinks for our bodies. When we sway from those, we’re going to get into trouble health-wise. This is a good way to look at nutrition. My philosophy is similar, focusing around real foods as much as possible. Surely you mean ‘Nature’ as there is no such thing as ‘God’? If it is found in Nature, and presumably is not toxic, then it is beneficial for our bodies, which includes a good steak of course. I would like to point out that the statement ‘The main risk factors for Type 2 diabetes are being overweight or obese, an inactive lifestyle, and a diet high in overall calories from any source.’ might not be entirely correct. I am Type 2 diabetic and I got it because it runs in my family and not because I am overweight , obese or have an inactive lifestyle or consume a high overall calorie diet. Yes, I was thinking about that, too. For many diabetics, there is a genetic predisposition, and they need to be extra vigilant about monitoring their diet and activity. While careful monitoring may decrease the risk, it doesn’t mean that the risk of becoming diabetic goes away. Among my friends and family, there are diabetics of every variety; some are slim and active and moderate eaters, some are a bit overweight and active, some are slim and sedentary, etc… We are each our own individual “control group” in the experiment of finding what works best for us. This is a good point in nutrition in general – size does not equal health, and bioindividuality is the key to understanding our unique health situation, diabetes risk or otherwise. There is a genetic component to type 2 diabetes, and having it run in the family increases risk. For example, if one of your parents has type 2 diabetes your risk of developing it yourself is about 1 in 7, and if both of your parents have type 2 diabetes the risk increases to 1 in 2. And it is important to note that size does not equal health, so there are many people who are overweight and don’t have diabetes, and many diabetics who are not overweight. Having said that, for the general population the main risk factors for type 2 diabetes are overweight, obesity, and lifestyle factors. But not sugar consumption per se! Very interesting Katie – I enjoyed reading this post! Good read, I think you’re right about a holistic approach, avoiding excess of anything. I recently have been trying to reduce the amount of sugar I eat simply because I believe it to be too much. In the morning I tend to have Weetbix for breakfast (an Australian thing) Typically I would sprinkle a dessert spoon of sugar on top. I still do this every now and again (Sundays) but generally just have them plain. I think my gut is thanking me for a lower sugar diet, overall I feel as though my tummy is less upset than usual since making the change (be it psychosomatic or whatever). It’s amazing how we can become accustomed to less sweet things, isn’t it? Enjoy your sugary Weetabix on the weekend, but having them plain during the week is a great strategy. Loved this post. Health coaches and blogs seem to run from one trend to another. One day fat is bad. Then sugar is bad and EVIL. One day agave is in and the next day it is pure EVIL. Now everyone in GLUTEN intolerant. Stop trying to demonize food. Eat simple, whole foods mostly. Well said! It’s hard to keep up with all the trends, isn’t it? But if we’d just get back to basics and eat real, whole foods, we’d have a lot fewer problems overall, wouldn’t we? Exactly! You think people would know this by now, hm? About 35 years ago, I read a book called “The Sugar Blues” and that helped me to understand more about added sugar and the sugar industry. I decided to go a year without eating any foods that contained ADDED sugar in any form, and in the first four months lost 40 pounds! Since then, I’ve consumed sugars, but am more mindful about doing so. If an author is going to write a book about “A Year Without Sugar”, it should be about A YEAR WITHOUT SUGAR! of any sort–not just the white stuff that comes in a bag. Hey…maybe I should write that book. I would have to live that year again and journal it this time, because I had no idea that is what I should have done back then! 🙂 It should be much easier now, with several decades of mindful consumption under my belt and my appetite rewired by that. That first time was a challenge…especially since I had three small children who were accustomed to the usual sweet baked goods pretty much on a daily basis. They’re all grown with children of their own, who are also pretty mindful of their sugar intake, and know, as far as sweets are concerned, Bubby is the fruit lady–if they have a baked item from me, they know it has been revamped, modified, or made from a recipe found online in a healthfood site! Beverly, you’ve touched on one of my pet peeves! Whenever I see a recipe that says ‘sugar free’ or ‘no sugar’ and then calls for honey or maple syrup?! It’s still sugar! I of course love both of those sweeteners – in moderation. It also makes me crazy to see recipes that call for no-calorie sweeteners as an alternative to sugar. That stuff isn’t natural at all! Maybe you should write this book, it seems like you had a great experience the first time around, why not do it again! Yes, Katie, that, too, regarding the alternative sweeteners. Those are even more toxic than plain old sugar! As often as possible, I try to encourage folk to give their taste buds the opportunity to adjust to the natural flavours of Real Food, or to at least reduce the amount of added sugar in their meals…it takes time to retrain ourselves, but the benefits far outweigh the “moment of pleasure on the lips”. And, then, perhaps, an occasional indulgence, but sometimes that can be counterproductive–a “just this one time” sweet triggered a binge year following the year of no sugar! Eventually, that tiger was tamed, but not without a fight. As always, you’re the voice of common sense and reason in a world full of dramatic headlines and half truths. Thanks Katie for this super informative post. I’m so glad I read this! It’s so good to hear the science behind sugar, because there is so much misinformation out there. It can be very difficult to sift through all the conflicting information out there, especially since it changes so frequently. Glad you enjoyed the article! Great post Katie! I have never gone on a diet, and especially loath all of the fad diets that come and go. Like you said, all food is broken down into some amount of sugar when its metabolized. The key is to make sure that most of the sugar we eat is coming from whole foods, not processed and refined foods. I use coconut palm sugar in some of my recipes because I like the earthy taste, and it’s supposedly a lower glycemic. Although the jury is still out on that subject. It makes me cringe to hear people say that they cut all sugar out of their diets. What? They stopped eating? Or, they reduced their fat intake. The human body, and the brain needs fat to operate properly. Don’t do that! Anyway, great post! Thank you! I think we get into trouble with nutrition when we start focusing too much on nutrients and not enough on food. And it’s a lesson we just seem to never learn! I haven’t read anything conclusive on the coconut sugar / GI connection yet, so I think if you like the flavour then go ahead and use it in moderation, but don’t consider it a ‘super sugar’ as it were. I LOVED this, Katie. Thanks for being a voice of reason. I will be sharing this and thinking about it as well. It seems to be in the Western world we want to have it all and cannot accept food with it’s limitations.. so there is the constant need to justify what we eat, instead of just being able to say.. I’M EATING THE DAMN CAKE WITH GLUTEN AND SUGAR. It’s ironic given the fact that half the world over sugar is a luxury most people would love to be able to afford. One note – as a parent, I appreciate your realism about hyperactivity and the research as well. I still prefer to severely limit our kids’ sugar intake for no other reason than their appetites aren’t huge, and I would rather they fill up on veggies, protein and fruits.. and also sugar keys them up a bit much.. and their taste buds are just forming, I would prefer for it to be formed by non sugary things..
Good point, Devi. Sugar is such a luxury in some places, and those calories are precious in others. We need to learn to indulge from time to time and not feel bad about it! I think your approach to sugar with your kids makes sense. Fill them up with good stuff and teach them good nutrition habits for years to come! Katie, can you comment on the topic of sugar affecting and even damaging the hyper thalamus? My husband read about it somewhere and is now very wary of our child consuming sugar for that reason. Thanks for your amazing website! I’ve made a ton of your recipes. hello! i am interested in the artificial sweetners part, knowing its a very controversial issue. i understand you are against it, but i am interested in your position. seen too many articles about making and refuting a connection between the different kinds of sweetners to weight gain, diabetes, hunger, cancer, etc…. I did my MSc thesis work on artificially sweetened beverage consumption vs regular sugar sweetened beverage consumption and the risk of developing type 2 diabetes. We pooled data from over 300,000 people and the results were astounding! I also explored physiological mechanisms that might explain this connection (there was a much higher risk when consuming ASB) and uncovered some really bonkers stuff. It’s all too much to get in to here (and the work is being submitted for publication, so I can’t talk about it too much) but needless to say if I was against artificial sweeteners before, I’m REALLY against them now. There are some very specific cases when I think they are a necessary evil, for example in a ketogenic diet used to treat children with severe epilepsy, but in all other cases, I think they’re unnecessary and extremely unhealthy. I have three questions. First, what about black strap molasses as a sweetener? I happen to love the flavor, but I also tend to figure it has enough nutrients in it to make it an overall nutritional plus. Thoughts? Second, can you comment on the assertions I’ve seen everywhere recently that sugar is inflammatory, and therefore essentially evil? The second part of that sentence obviously seems like hype, but I wonder about the first part. I tend to assume some refined sugars are fine so long as I’m getting enough nutrients and am active enough to compensate for the calories. For this reason I’m more likely to eat refined sugar on long hikes or runs, where the quick energy feels helpful. But is sugar actually inflammatory? Finally, do you think the issues with artificial sugar also apply to stevia and other sweet but non-caloric natural substances? Blackstrap molasses definitely have more nutritional value that refined sugar does, but at the end of the day it’s still sugar. So is it a healthier choice? Yes. Does it turn your dessert into a ‘health food’? No. But it is definitely a better choice when it comes to sweeteners. Foods with a lot of added sugars typically have a high glycemic load, which spikes insulin levels and fuels the fires of inflammation. Chronic inflammation and increases the risk for almost every major chronic disease we face as a society. So to answer your question, yes, sugar is inflammatory, and yes, the second part of that sentence is hype. The type of sugar consumption you’re talking about doesn’t worry me, and are situations (along with special occasions, like birthday cake!) I’d probably choose refined sugar as well. To be honest, I don’t yet know how I feel about stevia and similar substances. When I was researching artificial sweeteners for my MSc thesis, a lot of the proposed mechanisms by which they are damaging start with taste receptors in the mouth. Stevia did pop up from time to time in a similar way, but I didn’t do a deep dive into it. At the end of the day I think there is no magic pill and if it seems too good to be true, it probably is. Stevia is outside of my personal comfort zone, so I don’t currently use or recommend it. But like I said, I really don’t know enough about it to decide what I think about it or pass judgement on it.